There’s this thing that C. S. Lewis said, about how when he grew up he put aside childish things, including the worry over enjoying things which are childish. I find that really applies to me. I’m a busy, busy guy. I have my side business, my writing, my demanding day job, the podcast, and of course my relationships because I’m poly. In the past, I’ve lamented that sitting on the couch and playing video games is garbage time, and wasteful. But after sitting and thinking about it, it really isn’t. Overwatch is a heck of a lot of fun. It’s a social outlet too. I have some very nice friends through the game whom I enjoy playing with. The nature of the game is inherently collaborative. It’s about as close as I’m ever going to get to being on a sports team. Over the several years I’ve been playing it, I’ve really grown my skill at it too. I know that staying grouped up is better than playing alone. I know that the healers/support should stick with the tank, while the DPS (damage per second) folks flank around. I know how to use the environment to enhance my own play style. And, most importantly of all, I know that engaging in something I enjoy, in moderation and balance is emotionally good for me. It’s taken me ages to figure all this stuff out. Sometimes, stuff I do just makes me so happy. I adore my illustrator Jenn Solo. She and I have been working together for over a year now. We’ve been making new illustrated fiction together. I’ve been narrating some of it, working with other narrators too. A month or so ago I had this idea for a new series of stories about Little Sprocket, an age player in her 20’s, who’s new and exploring. Sprocket knows she likes diapers, knows she wants to be spanked, but isn’t at all sure about anything else. I also had this kinda bizarre, meta, experimental idea to give Sprocket her own fetlife profile. I was telling my friends ResonantYes and roadnottaken of the Love in Brief podcast about it, and asked them for help narrating it. And they had this amazing idea to do a mixed narration to record it. Part RY, part rnt, all awesome. It turned out so, so good. But don’t take my word for it, take a listen to a little bit of it for yourself. I’m beside myself with glee at how good it sounds. Cheery, huh? Actually, it is. Stick with me on this one, folks. Endings and death have been on my mind a whole lot lately. First off, two days from now will be the one year anniversary of Andrea’s passing. Secondly, about two months ago, Squee and I broke up, after about four years together. It’s okay, really. I still love and care about her. But things change. Third, my new job is demanding, and causing me in many ways to re-evaluate myself as a person, in all sorts of ways. I go to bed early, get up early to drive a long way to do a job I’m sort of teaching myself to do as I do it. It can be exhausting. Last night I came home from work fully intending to work on my side business, do some podcast related work, and attend to a nagging bill related chore too. Instead I sat on the couch, lost at Overwatch for about 2 hours, and put myself to bed early, feeling low of spirit. This morning though, I feel great. I had plans to get out the door by 6:15, an hour ago. But those plans died on the vine as I realized some other things I had to do. I made breakfast, packed my lunch, changed the cat litter, and realized I don’t have to push myself to do everything and anything all at once. This is something Andrea knew and knew well. Don’t mistake me, she wasn’t some sanctified guru who floated an inch off the ground, and whom nothing ever bothered. So many of the phone calls and visits we had with one another started off with one of us engaging in a good old fashioned bitching session about something. But the thing she knew, and which I also know but keep forgetting which is also, by the way perfectly human, is that everything and everyone dies. Every moment dies. Every plan dies. And when they do, they leave the ground where I’m standing fertile and ready to receive this very next moment. Take this morning. As I made my breakfast, and checked my watch, I thought I might have enough time to change the cat litter this morning. When I went to check it, it was in a terrible state (Sorry kitties!) and I knew that I had to change it. So I did. If that means my commute will bloom up to 90 minutes today (which is very likely), well so be it. That’s okay. I will witness the death of the old plan and welcome the new one. I know that because of my abandonment issues I have a tendency to want things to last. When I see that long arc of persistence grow around me, I lean into it and get comfort from it. It’s not an entirely bad thing either. It’s immature to divide the world into simple, absolute binaries. Yin contains Yang, and vice versa. No matter how much energy I pour into anyone or anything in my life, it will eventually die. That’s tragic, yes. But it’s also comforting. Love and pleasure come to a fold, yes. But so does pain and suffering. That’s why it’s so import to just keep swimming, like Andrea always used to say. The fact that the swim ends is what gives it beauty. As I write this, i’m getting ready to go to the gym to go swimming. For Christmas this year Missy got me an Apple Watch. I’ve been using one of its applications, that tracks movement, standing, and exercise as rings. 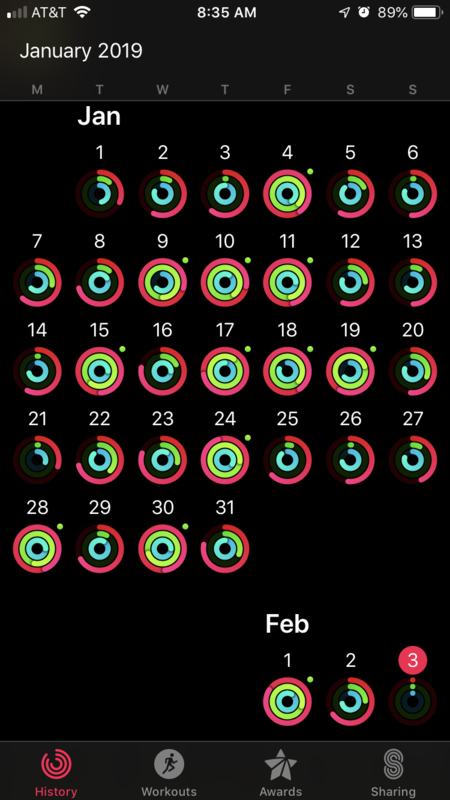 Each day the rings start out empty and you fill them as you go. Workouts are an implicit thing, You tell the watch what you’re about to do and it tracks it with extra detail. This really works for me. For one thing, the data gets shared with another application I use, Lose It. It makes it so easy to really see the benefit and interrelated nature of my choices. It’s also a sort of gamification of being healthy. I know that the swim I do a few days ago can allow me to eat an ice cream sandwich a few days later. Or conversely, see how I feel and how my weight fluctuates based on the amount of exercise I get. It makes me able to stand back a few feet from individual choices and see how they knit together. All of which combined, help me be more fully present in both what I’m doing and why I’m doing it. I’m really excited to grab a quick shower, get dressed, & get to my gym. I like those closed green rings. I like what they do to and for me. #gratitudeNow: Here I grow again…. 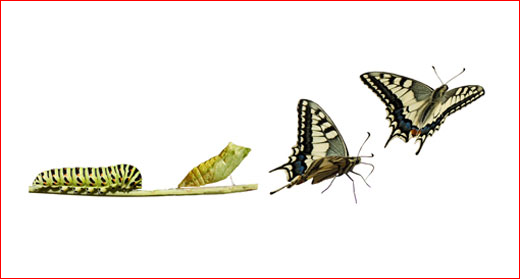 So my contemplation today is about reinvention. I recently started a new job. It’s interesting how in my day to day interactions with new folks I keep bringing up prior experiences in my head and using them as the basis for new ones. I got into a big meeting the other day about how to plan and execute work, how to deal with changes in technology, and share work smoothly. I brought some good, strong opinions to the table. But was also open to listen. And in the process saw something that kind of blows me away. It’s like I’m simultaneously the same person I was at my old job, and a whole brand new one. I’m reinventing myself. Being mindfully present for it is mind boggling. I can feel myself… well, growing. It’s big things and little things. I made the decision to consistently be an early morning arrival. I decided to openly embrace learning some new technologies. And it’s just happening. I’m making it happen.